Suh M, Casteel S, Dunsmore M, Ring C, Verwiel A, Proctor DM. 2019. Bioaccessibility and relative oral bioavailability of cobalt and nickel in residential soil and dust affected by metal grinding operations. Sci Tot Environ 660:677–689. Including measures of relative bioavailability (RBA) improves the accuracy of site-specific risk assessment when evaluating metals bound in matrices that resist acid digestion (alloys, slag, tailings). 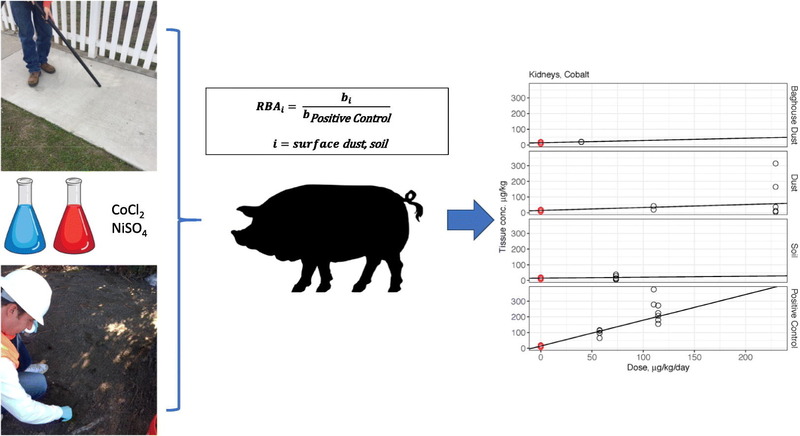 In vitro gastrointestinal bioaccessibility and in vivo RBA assessments were conducted using baghouse dust, surface dust, and soil collected in a neighborhood near a metal forge, which emitted metals in the form of corrosion resistant alloys. The study objective was to characterize the in vitro bioaccessibility and relative bioavailability (RBA) of cobalt and nickel when ingested as freely soluble forms (ionic salts used as the basis for oral toxicity criteria), compared to when incidentally ingested in the forms found in the environment. Test materials and standard reference materials—cobalt chloride and nickel sulfate—were administered daily for 14 or 21 days, twice daily, to juvenile swine. Daily intake doses for cobalt were ≤229 μg/kg-day, and for nickel, ≤1419 μg/kg-day. Concentrations of cobalt and nickel were measured in various tissues; 24-hour urinary excretion of each metal was also measured. Multiple linear regression modeling was performed for tissue concentration or urinary excretion vs. dose in each material, with weighting as inverse variance in each dose group. Liver, urine, and kidney provided the optimal data. Although RBA values were affected by limited absolute bioavailability of cobalt and nickel in reference materials, trends across the different biological matrices consistently showed significantly reduced bioavailability of cobalt and nickel in soil and dust, with RBAs ranging from 0.2% to 12%. Bioaccessibility of cobalt and nickel in soil and dust were 1% to 5%, and similar results were found for baghouse dust. The data demonstrate that cobalt and nickel in soil and dust affected by alloys are resistant to bioelution and absorption. This study provides useful information for site-specific risk assessments and insights for planning future research.